Last time around I ran into two major issues. Fragility of the part. Using 1mm diameter pivot pins using the detail material (weak) was not a good idea. Coupled with the tight pin problem above, it meant I accidentally snapped a couple of pivot pins off the blades when I tried to rotate close the iris. Coarse triangulation of the exported STL which made the two rings too ‘blocky’ to rotate freely with each another. My fault, fixed by (labourously) tweaking/experimenting with Alibre’s Export. So how did I fix it all? 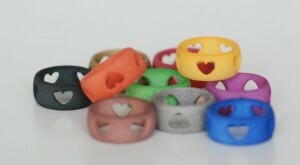 I just ran into this Shapeways Blog Post and couldn’t resist reposting this photo of those colourful ring fest. If you’ve read earlier in my mechanical iris diaphragm post I was just playing around with Alibre Xpress and see if I could design a ring using that, guess someone at Shapeways thought they were cute and printed them out! The rings are painted using a water based paint, I just wonder how it’ll look with an acrylic paint to smoothen out the surface somewhat. Author MadoxPosted on December 3, 2008 December 3, 2008 Categories Perverse Applications of Science...Tags 3D Printing1 Comment on Cute colourful heart rings! Controller-Area Network or CAN Bus is one of many automotive communication buses for communications between various ‘car computers’. Information such as speed, fuel consumption, accelerator pedal position is all transmitted between the various controllers of a car akin to ‘fly-by-wire’ control systems of aircraft but I guess ‘drive-by-wire’ is more appropriate in this case. There are other rival bus technologies include LIN (Local Interconnect Network) which is supposed to be a lower cost alternative to CAN, but I’m not interested in that. Why? My car uses the CAN bus, not LIN, not Ethernet. 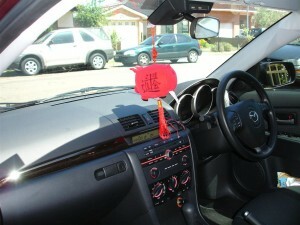 So lets go about figuring what can be gleened from the communications whizzing around my car!